Add high-capacity Compact Flash storage and USB transfer to a real-time looper's facilities and you've got a host of new potential applications. What could the Jam Man do for you? Phrase sampler/looper products have a number of potential applications, from indefatigable practice partner, to compositional aid, right up to multi-overdub, improvisational performance tool, in the vein of Robert Fripp's famous tape loop-based system. 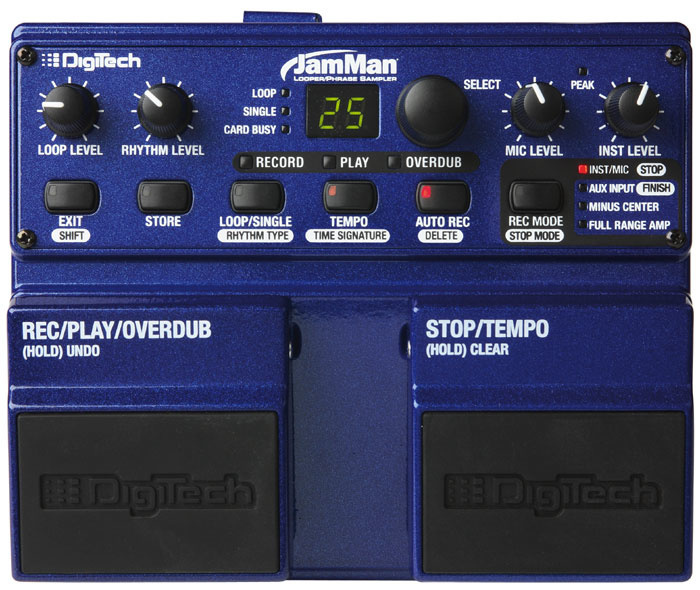 The original Jam Man, from which this Digitech unit gets its name, was a rackmount Lexicon product from the early '90s (both Digitech and Lexicon are now part of the Harman group) that offered just eight seconds of recording time, upgradable to a (then) whopping 32 seconds! The unit would sync to MIDI clock and could be controlled remotely via MIDI, but anything you recorded would be lost when you powered down, and even a maxed-out memory was only enough for a few short phrases. Today, in the era of cheap RAM and Compact Flash memory, not only do you get much longer recording times — 24 minutes as standard and up to six and a half hours with a 2GB memory card — but data saved to the card can be retained indefinitely. This immediately takes the looper away from just being a spontaneous self-accompaniment aid into being a seriously useful live playback tool. Add in the facility for up to 99 separate phrases or loops, recallable via footswitch, and the ability to archive/transfer via USB connection to a computer, and you've got a highly flexible 'backing band in a box'. Onboard DSP allows recorded audio to be speeded up and slowed down without affecting its pitch, making the Jam Man an ideal learning aid, especially as the shifted audio quality remains remarkably good, considering the unit's UK price point. If anything, it is in the function of live performance looper that this incarnation of the Jam Man perhaps impresses least. When you use a loop recorder in free-run mode (in other words without the underlying time-base of a pre-programmed click or rhythm track), the timing of your Record and Loop footswitch presses is crucial. Most people can get in and out on the beat OK, but if you are looping a phrase that starts after the downbeat, you need to get out at the exact same point in the bar where your phrase ends, otherwise you will get some 'dead air' in the loop. It takes a certain amount of skill and feel, but experienced loopers get very good at it. Tapping your foot on the required beat subdivision in the run-up to the punch-in/out makes all the difference. 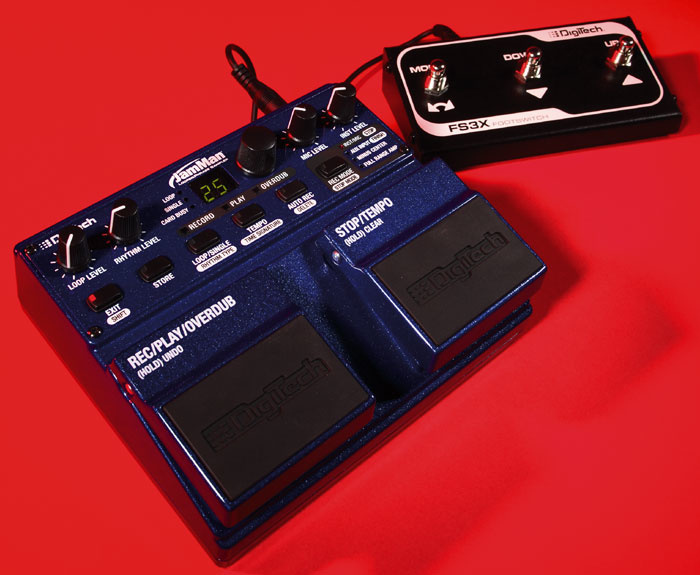 A low-profile footswitch with almost zero travel-to-activate is therefore obviously an asset, as you can just swivel your tapping foot sideways and switch without breaking rhythm. Photo: Mike Cameron Photo: Mike Cameron The Jam Man's internal Compact Flash card shows up as an external drive when connected up via USB to a Mac (as shown here) or PC. This drive contains a folder for every stored loop, and each of these folders contains a WAV file of the loop along with an XML partner file of settings relevant to that loop.Photo: Mike CameronThe Jam Man's guitar stomp box-style footswitch is less than optimal in this application. It has a long travel before it activates the switch, it is mechanically stiffly sprung, and it sits a fair way off the ground. Also, given that a lot of loop performers are solo acoustic guitarists (albeit amplified), the footswitches are mechanically noisy when stepped on with sufficient velocity to achieve reliable timing, emitting a loud metal-to-metal 'clunk' that announces to the room "Hey, I've just triggered a loop! ", when one would probably rather not draw attention to the process. There's also no facility to save a loop to the memory card via footswitch — in fact, you can't save at all without interrupting playback, so the lack of a footswitch 'save' is largely irrelevant. This means you can't, for example, start playing a part, capture it as a loop, improvise or play a melody part over the top, save it on the fly, move on to the next memory location to do the same again and then recall your original backing part. This is a great shame, for in live performance terms it means you haven't got 99 loops to play with, you've got one. To be fair to the Jam Man, you can't 'save during play' on other pedal-type loopers either, but with so much storage available on this particular model, it seems something of a missed opportunity. There's no MIDI — understandable at the price — which means no MIDI sync and, perhaps more importantly, no chance of using a different physical control interface, such as a MIDI pedal board of the kind that most people used with the original Jam Man. I guess when the list of target markets for this undeniably multi-talented product was drawn up, real-time loop performers weren't at the top. The unit is ruggedly built to withstand stage use and abuse, like all the current Digitech range. Power is solely via an external 9V AC power supply, with no battery power at all — a better option in my view than including a battery compartment if the battery life would have turned out to be impractically short. A 9V AC, 1.3 Amp power supply is not the sort of thing you are bound to be able to borrow from a fellow performer in the event of failure, so I think I'd be inclined to carry a spare if the Jam Man was going to be a core component of my performance. The input source can be either the instrument jack, a balanced XLR for mics, or a 3.5mm stereo mini-jack for line-level signals, with centre-cancel (for suppressing a centre-panned lead vocal or instrument) and Full Range Amp compensation options. The latter processes the input with a preset EQ to compensate for the limited frequency response of typical instrument amplifiers. This is a little inflexible, as once you've recorded it that way you are stuck with it, even if you now find yourself playing through a 'full-range amp'. (Yes, that's right; Full Range Amp mode is for playing through anything that isn't a full-range amp). An option to select the compensation EQ on replay, according to whatever you find yourself performing through, would be much better. A single peak LED flashes to warn of overload, although A-D conversion is at 24-bit/44.1kHz resolution and fairly forgiving of lower levels, so it's not worth pushing the input to the limit. Audio stored to the Compact Flash card is saved as 16-bit uncompressed WAV files. Basic audio quality through the Jam Man is fine — even the XLR mic input is quite decent, although there is no phantom power — and output-stage noise is acceptably low if you are feeding a PA or dedicated acoustic instrument amp. There's a fair amount of hiss when fed into the front of an electric guitar amp, but that is an inevitable function of feeding a low-impedance line-level output into circuitry optimised for a low-level, high-impedance magnetic pickup. The Jam Man's control line-up is relatively simple, given the sophistication of the functions on board, with only one 'shifted' alternate layer to deal with. The Select knob is a continuous rotary switch accessing the 99 numbered phrase memories — an adjacent LED illuminates whenever you select a location with saved data. An optional triple footswitch (FS3X) can be connected to a rear-panel jack giving a hands-free method of memory selection via its Up and Down switches, and also allowing you to change recording mode. If you want to move from Phrase One to Phrase Four, you just press the Up switch three times, or press and hold for fast scrolling. The most fundamental choice to be made before initiating a recording is whether to utilise one of the built-in guide rhythm patterns. This requires a tempo to be set in advance, using either the Stop/Tempo footswitch (again, the lengthy switch travel is far from ideal for this) or by tapping the small Tempo button in the centre of the control panel. Having set it, there is no way to modify it, other than by tapping again, which can be frustrating when an exact tempo is crucial to the feel of what you are about to record. The upside of recording to the click is that your loop length will be automatically quantised to the nearest beat, making the exact timing of your exit from the loop less critical. The rhythm guides, ranging from a simple metronome click up to kick-and-snare drum loops, offer a choice of time signature and independently variable level. Loop playback also has its own level control, and empty 'template' phrases can be saved with tempo and rhythm guide already set — well worth doing if you are creating a series of song components to be used together. You have a further option in Auto Start, which allows recording to be initiated by the first note that you play; as with the automatic recording function on samplers, you don't lose the start of the note, as a little bit of buffer memory is permanently recording. Auto Start tends to work best on material where your first note is on the first beat of the bar. Once a loop has been recorded, you can reactivate record mode to overdub more material as many times as you want, with a very welcome Undo facility always available for the last layer you added, all without stopping playback. The only time you have to stop is when you want to store audio to the memory card. Any phrase can be assigned to play back either in a continuous loop mode or in a one-shot mode that plays to the end and stops. This is useful for one-off sound effects, and for endings when you are constructing an entire song performance out of loopable phrases. Photo: Mike CameronThe Jam Man features a USB socket for connection to a Windows XP or Mac OS X computer, allowing file backup and exchange. It's not especially sophisticated — the files are just called Loop01, Loop02, and so on — but it gets the job done and I had no problems with it on a Mac running OS 10.4. Each WAV file has an accompanying XML file that tells the Jam Man where to put it and what to do with it. These are generated when the Jam Man records something, and it appears that you can't fool it by simply swapping an existing loop for a new piece of audio. This means that you can't use the USB link to put new audio into the Jam Man — you can only restore audio that you have recorded on it and then archived off. Not unmanageable, but not elegant either. The ability to organise and store multiple loops/phrases is what makes this incarnation of the Jam Man such a powerful pre-prepared auto-accompaniment tool. You can prepare an entire set of backing tracks or a number of loopable consecutive parts that you can footswitch between whenever you feel ready to move on to the next part, arranging on the fly. Handling of the loop ending or transition between loops is simple — press Stop or select the next loop before you get within three seconds of the end of the current one, otherwise the loop will go round again. No disaster if you are playing on your own, but a little more awkward in the context of a band. Given that there is no sync facility other than the audio itself, I'm not sure how practical it is to use this Jam Man as an extra band member. You certainly can use it very effectively in less sync-sensitive applications like intros, drones, and sound effects. Pity then, that the output is resolutely mono, when these, and especially whole backing tracks, are exactly the sort of things that work much better in stereo. Of course, you would have to have a stereo PA system for this to matter, but the wide-scale adoption of self-powered speakers means that most systems now have stereo capability, and in my experience there is now a greater awareness of the value of having at least part of your live mix in stereo. In spite of what it doesn't do, the Jam Man is still clearly the best thing of its type out there at its price point. It does an awful lot very well, and I think only the diehard solo looper would be disappointed in it. Well, no, not disappointed, more frustrated, for it is so nearly fantastic at that as well. Just give them a footswitchable 'save without stopping' facility and I suspect they'll be happy too! It's great if you are preparing loops or whole backing tracks in advance, and it's fine for noodling about at home until inspiration strikes, allowing you to try out melody lines over chords, or transitions between different sections of an arrangement. If you are only interested in playback of backing tracks, then a dedicated replay device like an iPod or similar mp3 player might give you stereo and a better user interface — you do have to remember your Jam Man set list by number rather than title — but footswitching still provides a discreet slickness in performance that visible button pressing can't match. Above all, the Jam Man is just fun to have around, giving a degree of spontaneity and musical satisfaction that can only be beaten by having a real live playing partner. And there aren't many products in the high-tech arena that we can say that about! Compact Flash storage allows up to 6.5 hours of audio. Audio can only be saved in Stop mode. Tempo setting is only possible via a tap-tempo facility. 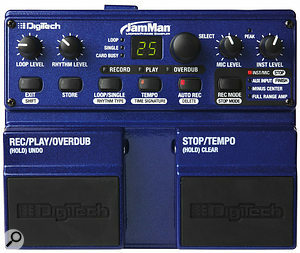 Fulfils the minimum requirements for a real-time looper (will record audio, loop it on the fly, and allow overdubbing), but it's actually the Jam Man's other capabilities of up to 6.5 hours storage and high-quality tempo change whilst maintaining pitch, that win it the accolade of 'best in class'.